S.S. #8 Trafalgar was founded in the 1830s and was located at the corner of Derry Road and 9th Line where the hamlet was known as "McCurdy's Corners". 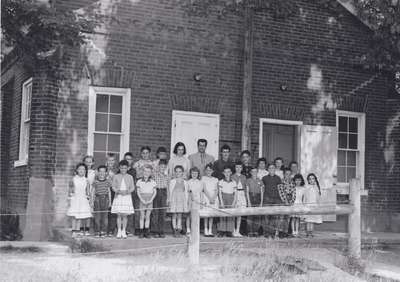 Pictured here is teacher Jack Loos with 27 pupils. The brick school was later use as a community hall until 1969 when it was purchased by Gerald Jensen who converted the building into a multi-storey home. The schoolhouse is no longer standing, as it burned down in November 2007 and was then demolished in 2008. McCurdy's Corners was taken into Mississauga in 1974, transferred from Trafalgar Township.